My name is Aaron Sistare. I am from Greensboro, North Carolina. I decided to join the Aardvark Israel Gap Year Program so that I would be more mature, responsible, and independent for my near future in university and later in life. Even though I am not very religious, I love living in Israel, both Tel-Aviv and Jerusalem. I thoroughly enjoy being able to learn the culture of my people. I currently work in the center of the Jerusalem shuk at a place named 1אַגָס. It is a vegetarian restaurant that has the best hummus in the entire world. Last semester in Tel-Aviv, I helped the hungry by volunteering at a local food drive on Sundays and the rest of the week I would intern at a veterinary office where I was able to pick up an insane amount of knowledge and experience for the pets that we love. I feel that I now understand more about what I want and no longer want to study and become. My goal of this program is to meet people from all around the world that share similar and different experiences and to see what the world is like living outside of my home state and country for the first time. I decided to go with the special interest add on option called “Nepal Cultural Exchange”. The Nepal Cultural exchange is a two week trip to Nepal operated with an organization called Tevel Bezedek. While my friends and I were there we witnessed first hand how amazing, different, and quite dirty the place was. While at a homestay, we met random Israelis who were traveling after the army. I later learned that so many Israeli youngsters go explore the world as a way to take a break and really enjoy their life since they accomplished the army and now have to figure out what they would like to do with their life; similar to what we do after high school as a gap year. 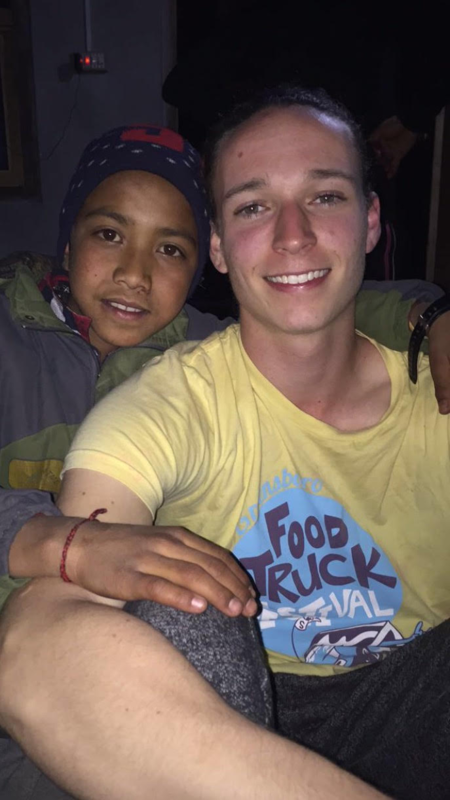 We helped clean and improve on a village located way up in the mountains and experienced what it is like not being able to take cars or busses everywhere. We went to so many beautiful and unique temples, saw the Himalayas in clear sight, and most importantly learned how the locals live and survive. Talking to locals is the best way to truly learn about the culture and customs that each area has to offer. My favorite story was about a first born daughter from a lower class who chose to move away from her family at six to help support her family members who could not leave the home. After two years, she could speak the language and started working random jobs wherever she could in order to make the most money. At age 20, she got married and moved to a different village where she now has a four-year-old boy and the husband was forced to leave Nepal and work somewhere where he can make a decent living, he chose Malaysia. This husband has not seen his baby boy or wife for 3 years. This is a common story of Nepal, the women are the true workers there because the men have all left in order to provide for their family that stayed. I truly feel that I can see the world more clearly after seeing so much variety in cultures from my journey this past seven months. For future Aardvarks and other gap year people, my advice for you is to get out and see what is going on around you and talk to people who live there to find out the greatest spots and stories ever! This is a pic of my coolest homie who lived in the village, his name was D’Redz or something like that. I wanted to adopt him and keep him as a brother/son.